Ramadan is pan-Arab television’s holy land – a month-long sweeps, where the post-fasting masses hunger for entertainment. As a result, there is intense pressure to compete and innovate for new programming. 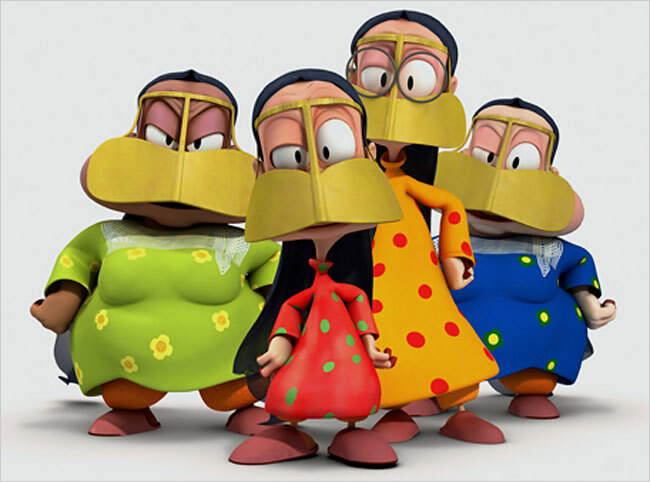 One of the recent hits is Freej, the first 3D animated TV series for the region, about four diminutive veiled grandmothers. The show is the brainchild of 31-year-old Mohammed Saeed Harib, a Dubai native who studied at Boston’s Northeastern University, where he was inspired by South Park and the Simpsons to create homegrown characters rooted in his own culture and identity. The show finds humor along the dominant fault line of this city: the tension between old and new. Set in Dubai, where camel races are conducted mere miles from the base of the world’s tallest building, the series focuses on four secluded and sometimes stubborn grandmothers. […] Before long Mr. Harib was being praised as the Matt Groening and the Seth MacFarlane of the Middle East. These references to the creators of “The Simpsons” and “Family Guy” are not lost on Mr. Harib, who noted that he was named to a local business publication’s list of the world’s 100 most influential Arabs. But the show never attempts the risqué humor of American cartoon sitcoms. Instead it tackles hot topics like wedding traditions and bribery in a distinctly Arab way, sometimes merely hinting at issues. Motioning straight ahead, Mr. Harib said, “You can’t go like this.” He made a curve with his hand and said, “You have to go like this.” He joked that he could compare sexual behavior to the eating of an apple, but said that he hadn’t written an episode about that yet. “Freej” stoked controversy in its first season with an episode that alluded to Islamic extremism. The episode was pulled from repeat broadcasts but still appeared on the DVD of that season. Sarah Al Jarman, the programming and acquisition manager for the English-language channel Dubai One, introduced a subtitled edition of “Freej” to give non-Arab viewers a glimpse at a locally created animated series. She said the episodes “actually reflect many local old ladies” in the Emirates, featuring their traditional dress, language and habits. As for exposure in the United States, Mr. Harib said he had met with executives from Cartoon Network and Universal this summer. If “animation exports the cultural values of the nation,” as Mr. Harib put it, then he said he wanted “Freej” to continue to represent his native Gulf state, even abroad. If the Arab cultural references can survive the dubbing process, then it might very well succeed. Maybe we will be watching Freej in the US next Ramadan?